The enormity of the Koch fortune is no mystery. Brothers Charles and David are each worth more than $40 billion. The electoral influence of the Koch brothers is similarly well-chronicled. The Kochs are our homegrown oligarchs; they've cornered the market on Republican politics and are nakedly attempting to buy Congress and the White House. Their political network helped finance the Tea Party and powers today's GOP. Koch-affiliated organizations raised some $400 million during the 2012 election, and aim to spend another $290 million to elect Republicans in this year's midterms. So far in this cycle, Koch-backed entities have bought 44,000 political ads to boost Republican efforts to take back the Senate. We may not be able to get Koch to open his records, but we can make Congressional Representatives open theirs! And if Koch or any Koch Industries are on the books, we can let them know with letters and our vote that this is unacceptable. I'm not saying it won't be a fight but we can prevent the Koch brothers from owning our country and our government if enough people can be informed and will act. I don't care what is your political affiliation, there can be no doubt that this kind of manipulation and control is not in the best interest of our country! Brian, thanks for sharing this. Let's work together to get this news out where it can do some good! Always happy to see people spreading the word about these two. Though I know there are at least three brothers, might be four. This Nazi take over of our country has to end before we lose it all. Vote like we're in the WAR we're in! The Koch's have been involved with making our laws through buying politics for maybe decades....funding the teaparty and Americans for Prosperity group to name two. FYI Koch Industries largest privately owned company in the USA. involved in refining and chemicals; process and pollution control equipment and technologies; minerals; fertilizers; polymers and fibers; commodity trading and services; forest and consumer products; and ranching. and they want to OWN the USA too. Noted. Many thanks for posting this excellent piece, Mari's. I think Kathleen M. (above) was referring to the Koch rebuttal to this. I read it earlier on RSN site; along with Tim Dickenson's responses to their complaints. And, let's not forget their State Policy Network, which I believe is in nearly every state. Here in AZ, GOP members of our state legislature take their marching orders from this. Fortunately, we have many alternative sites which are only too happy to point out candidates that take Koch money. Another good thing is that there is pushback in TV commercials denouncing candidates who take their blood money. Noted. A very informative article. Thank you. 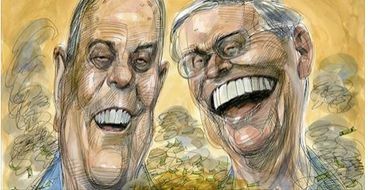 I believe the Koch brothers are evil selfish people who a ruining our political system. If you want to decrease their power in American politics don't vote for any Republican candidate for the next two decades. Noted. They are a disgrace to the world.